When you find a participant and click their Interview link, the Interview page is displayed. This page gives you an overview of a participant’s interview and shows the status of each interview stage. It is from this page that you start working on each stage of an interview and to which you are returned after a stage is complete. 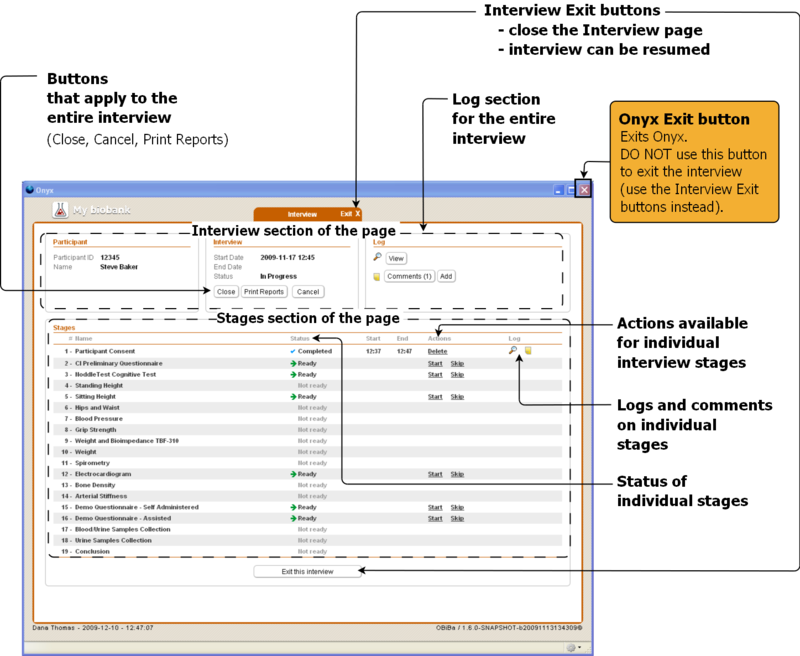 This figure shows the Interview page and points out some of its more important features. they release the lock that was put on the interview when you entered the Interview page. See Obtaining a Lock on an Interview. You can select either Exit button when you need to leave the Interview page before the interview is complete. They can be used at any time and do not affect the status of the interview. The two Exit buttons function in exactly the same way—there are two of them for convenience sake. The Onyx Exit button (the X in the upper right corner of the Onyx window—see this figure) is not the same as the Interview Exit buttons. If you select the Onyx Exit button while in the Interview page, Onyx will close immediately without releasing your lock on the interview. The next time anyone (including you) looks for the participant in the Participants list, a lock will be displayed on the interview. A participant manager will have to unlock the interview. See Unlocking an interview. Close button — You select this button if you need to end the interview early (before all stages are complete), but do not need to withdraw the participant from the study. CAUTION: If you select Close, you will not be able to resume the interview. Each study defines what will be done with the data acquired to the point of stopping an interview in this way. Print Reports button — Each study can define one or more reports that can be printed and given to the participant. You can select this button after any stage of an interview. It allows you to print reports as you go along rather than waiting until all stages are complete. Cancel — You select this button if you need to cancel the interview and withdraw the participant from the study. CAUTION: If you select Cancel, you will not be able to resume the interview. Each study defines what will be done with the data acquired to the point of cancelling the interview. Log panel (in the Interview section of the page) — You use the buttons in this panel to view system messages and user comments for all the stages of the interview. You can also enter general comments about the interview. Log column (in the Stages section of the page) — You click the icons in this column to view logs (system messages and user comments) about particular stages of the interview. You can also view a list of user comments only for a particular stage. (View button) — The Interview page contains several of these buttons: one for the interview in general, one for each interview stage that has been started. When you want to view a particular log, click its button. (Comments button) — Onyx users can add comments about the interview in general and about individual interview stages. The Interview page contains one or more of these buttons: one for the interview in general and one for each interview stage that has user comments. When you want to view user comments, click the appropriate button. Status column (in the Stages section of the page) indicates the status of each stage of the interview. See Stage Status. Actions column (in the Stages section of the page) indicates the actions that are available for each stage of the interview. See Stage Actions.